3 Minute Walk to Sea Street Beach! Location, Location, Location! Sea Street Beach is about 750 feet away (just a 3-minute walk)! 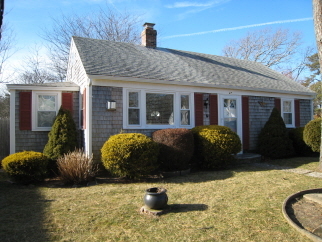 This year-round, 3-bedroom/1-bath beach getaway has had many improvements over the years. There is a vaulted-ceiling living room with gas wood stove, eat-in kitchen, newer bath (with stack washer/dryer), 3 bedrooms & enclosed porch. Gas, hot air heat & central AC. Newer windows, water heater & fully insulated. Spacious backyard, outdoor shower & shed. Property is NOT in the flood zone. Septic system has failed. The list price reflects that a new underground septic system is needed (plans & installation responsibility of buyer). Due to the failed septic system, financing options are very limited. A nice year-round/summer getaway and/or rental investment in a fabulous beach location! Don't miss out!